Though designed for ease of use, Windows 7 is so feature-rich, you’re bound to need help sometime. Browse through Windows Help to get assistance in using a Windows feature such as printing, setting a screen saver, and enlarging the cursor and onscreen text. 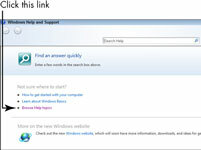 Windows 7 Help is organized by topics such as Printers or Using Your Mouse. You can drill down (get more detail) in Help’s Table of Contents by moving from a general topic to a more detailed topic. Windows Help is the only help feature that doesn’t require an Internet connection, although having one is useful because Windows Help and Support will get the most up-to-date help information for you automatically if you’re connected to the Internet. Some computer manufacturers (such as Hewlett-Packard) customize Windows Help to add information that’s specific to your laptop. One of the simplest ways to find what you need here is to use. 2Click the Browse Help Topics link. The Help Table of Contents, which is similar to a book’s Table of Contents, appears. 3Click any of the topics to see a list of subtopics, then click a subtopic to view it. As you click subtopics, eventually, you get down to the deepest level. When you click one of the lowest level topics (a detailed topic) its contents appears. Some subtopics contain blue links that lead to related topics or perform an action such as opening a dialog box. Green links display a definition or explanation of a term when clicked. If you’re having trouble reading the Help pages, increase the text by choosing Options→Text Size and then choosing one of the text size options: Largest, Larger, Medium (the default), Smaller, or Smallest. 4When you finish reading a help topic, click the Close button. The Windows Help and Support window closes. You can click the Print icon in the set of tools at the top-right corner of the Windows Help and Support window to print any displayed topic, if you have a printer connected to your laptop. You can also click the Minimize button in the title bar to minimize the window and keep it available while you work on your laptop.